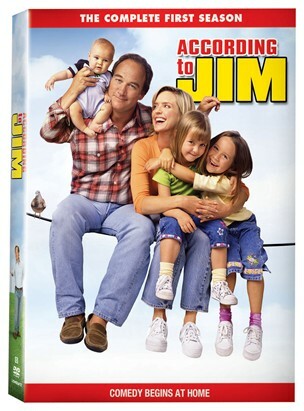 The first season of the outrageously funny family comedy “According to Jim” is available for the first time on DVD from ABC Studios and LIONSGATE®. Starring Emmy® nominee Jim Belushi (Outstanding Writing in a Variety or Music Program, “Saturday Night Live,” 1984) as an abrasive but lovable father and Courtney Thorne-Smith (“Ally McBeal”) as his gorgeous and feisty wife, “According to Jim” was nominated for two Emmy® awards and is one of the longest-running live-action comedies currently on TV. The According to Jim: Season One 4-disc DVD set features all 22 episodes from the debut season, which originally aired in 2001-2002 on ABC. Timed to coincide with season eight’s mid-season premiere, According to Jim: Season One will be available October 21st, 2008. In this earthy family comedy, Jim (Belushi) is the macho “everyman” who challenges wife, Cheryl (Thorne-Smith), with his stubborn manliness but contagious charm. Tagging along with this duo of happily married opposites are their three precocious kids. A success at his construction business and the family breadwinner at home, Jim feeds his other passion, blues music, playing with his six-man garage band. He keeps Cheryl in turmoil with his boyish bravado and ever willful antics, but their underlying love guarantees that they are in this marriage for keeps.